Science City Executive Committee. Front row: Elliott Cheu, Jennifer Casteix, Kirk Astroth, Amy Randall-Barber. 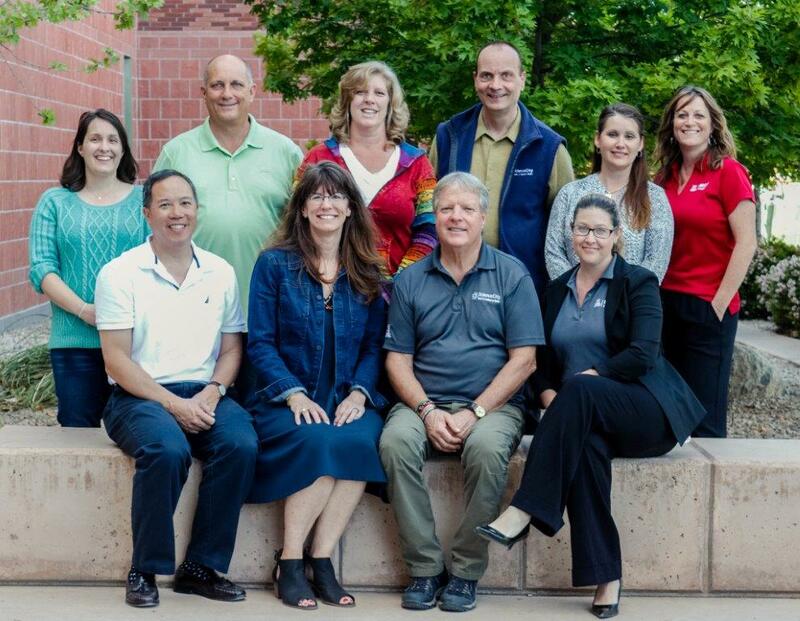 Back row: Barbara Kahn-Sales, Clark Reddin, Erin Deely, Uwe Hilgert, Kellee Campbell, Lisa Romero. Missing from photo: Chris Impey. There are employees all over the University who are willing to go the extra mile in doing their jobs and in helping their colleagues. Some of these employees will be recognized Friday at the annual UA Awards for Excellence ceremony, sponsored by the Classified Staff Council, the Appointed Professionals Advisory Council and the President's Cabinet. In addition to the Awards for Excellence, several other awards will be presented. Learn more about the honorees below. The Award for Excellence recognizes individuals for achievements that go beyond normal duties. Examples may include outstanding achievement in the workplace, exceptional contributions toward efficiency and effectiveness of operations, outstanding service to the University community and visitors, and special efforts in promoting workforce diversity. David Bradshaw, senior program coordinator at the Graduate College, was nominated by Meg Lota Brown, professor in the English department, for his collaboration and communication efforts in assisting with the professional development needs of almost 9,000 graduate students and more than 500 postdoctoral students at the UA. He coordinates the University Fellows Program and collaborates with the Graduate and Professional Student Council on multiple events. "David's leadership in preparing students helps to serve and promote programs, students and interdisciplinary research at the UA," Brown wrote in her nomination letter. Angeline Carbajal, program coordinator in the Disability Resource Center, was nominated for the lasting and positive impression she leaves on all who visit the center. She was nominated by Cheryl Muller, associate director of student access and engagement at DRC. Colleagues of Carbajal's say she is a go-to person in the office, always willing to help others. "Along with her work ethic, she is also a great friend," said Michael Beardsley, DRC program coordinator. "Angeline is easy to talk to and never panics when a sticky situation arises. She has established herself as a go-to person in and out of the office." Rebecca Drake, senior office specialist in the Office of the Registrar, is known for her knowledge, perseverance and kindness, said Drake's nominator, Fernando Chavez, associate registrar. "Her way of making everyone feel welcome, and always taking the time to make sure everyone has what they need, helps create a high level of respect and professionalism anywhere that Rebecca goes," Chavez wrote. Karen Feltz, outreach admissions counselor in the Phoenix Office of Admissions, was nominated by her colleague Emily Weaver, undergraduate recruitment assistant director, for the energy that she brings to the team. "Karen has gone above and beyond by serving on several committees and initiating the 'Mindful Minute' that helps team members to take a mental wellness break and learn something new," Weaver said. She has been referred to as the "backbone" of the Phoenix Office of Admissions and is always finding new ways to meet the needs of her students, including spearheading the first Honors College Scholar Brunch in Phoenix. Amy Jackson, medical administrative assistant with Campus Health and Wellness, is known by colleagues as "The Flash" due to her humor, unwavering enthusiasm and hard work, which help make the office a great place to be, wrote Cheri Anderson, office specialist and Jackson's nominator. "I thoroughly enjoy my time working with Amy and have come to know her as an extremely valuable asset" to the Campus Health service team, said Margaret Sifford, office supervisor, in the nomination letter. Jackson is a big supporter of all things UA, Anderson said, attending sporting events, volunteering for Commencement, and managing UA Cares for Campus Health, among other efforts. John Miller-Wells, manager of assessment for Access and Information Services at University Libraries, has been at the UA for 15 years and is often asked to serve as project manager for library wide strategic projects. He was nominated by Robyn Huff-Eibl, materials access team leader, for his commitment to a high level of service for library users. Miller-Wells participates in campus events that serve students, faculty and the Tucson community, like the Arizona Hackathon, Finals Study Break events and the Tucson Festival of Books. "He truly values diversity and the differences that each person brings to the work environment," Huff-Eibl wrote. Jubia Melissa Silva, student services coordinator at UA South, was nominated by Sarah Wieland, assistant dean of academic advising and student services at UA South. Wieland says of Silva, "she provides a one-stop shop for UA students in Douglas that includes community outreach, recruitment, admissions, orientation, financial aid and retention programming." She helped raise money for the Education Unidos scholarship fund, which helps support students of all ethnicities, economic backgrounds and immigration status. Amber Tetreau Segura, assistant director of admissions, immigration and student services in the Center for English as a Second Language, helps students in complying with immigration laws and policies and does so with empathy and understanding, says nominator Steven Randall, assistant director of curriculum articulation and academic programs at the Center for English as a Second Language. "As a supervisor, Amber encourages her entire team to achieve the impossible in the workplace and beyond," said Jeremy Lee, student activities coordinator at CESL. "She is always mindful of our workload, but doesn't shy away from pushing us to try new things, get involved with intercultural opportunities on campus, and volunteer for international education or University excellence in one way or another." Mary Venezia, director for enrollment initiatives and special events, was nominated by Kasey Urquidez, vice president of enrollment management and student affairs advancement. Venezia is responsible for the coordination of the UA Commencement ceremony and is known for her energy, leadership and networking abilities. Nick Sweeton, interim executive director of Residence Life and University Housing, said, "it's not what she does, but how she does it. Mary has a great sense of humor, amazing organizational skills and a kind persona." Jeffrey Welter, associate director for professional development for undergraduate programs at the Eller College of Management, is a career coach who has worked for the UA for seven years. His primary job is academic advising but he has developed an outside network to help students with career advising and job placements. "Jeff is known to bring a passion and enthusiasm to his role at the University that has been transformative for the students and the Career Advisory Department," Richard Sias, head of the Department of Finance, wrote in Welter's nomination letter. Kiriaki Xiluri-Lauria, senior staff technician for the Department of Geosciences, was nominated by Peter Reiners, head of the department, for the "passion and commitment to excellence that she brings to the department." Xiluri-Lauria created the Computational Geoscience Center with no funding by acquiring donated computers and turned it into a computing facility for student research and education. People from across the UA have called upon her for her expertise, and she is always willing to provide support, Reiners wrote. The Team Award for Excellence recognizes teams that have made notable contributions toward efficiency and effectiveness of operations, outstanding service to the University community and visitors, and special efforts in promoting workforce diversity. The Science City Executive Committee is a group from across campus that leads and organizes a STEM (science, technology, engineering and mathematics) learning experience at the Tucson Festival of Books. Science City is an annual event that requires year-round planning and organization. Campus units and community groups provide approximately 1,200 volunteers to staff the booths during the event. "The team is dedicated to providing an excellent experience for attendees, and their commitment to the event has resulted in Science City becoming the largest STEAM event in Arizona," wrote Marcy Euler, executive director of the Tucson Festival of Books. The Billy Joe Varney Award is named for a past director of the Student Union who dedicated his time at the UA to meeting the needs of thousands of students and employees who are served by the Unions. The award is given to a University employee who has at least 15 years of service. Maia Ingram, program director of community-based evaluation projects in the Department of Health Promotion Sciences at the Mel and Enid Zuckerman College of Public Health and co-director of the Arizona Prevention Research Center, was nominated by Abby Lohr, senior research specialist in health promotion sciences. Ingram was responsible for overseeing the center's renewal application in 2014. "Her work at the University serves not only Tucson, but the state of Arizona," Lohr wrote. "Ms. Ingram is influencing generations of leaders to serve others and foster public health." The Classified Staff Council Special Award recognizes an individual for outstanding support of and impact on classified staff. Amy Williams, communications specialist for the office of University Communications, will receive the award for the key role she has played in helping spread the word about Classified Staff Council activities and events. The Eugene Sander Shared Governance Award recognizes UA leaders who embrace and embody the ideals of shared governance and recognize the importance of appointed professionals and their contributions. Sander served as dean of the College of Agriculture and Life Sciences and as president of the UA. Gail Burd, senior vice provost for academic affairs, will receive the award for her work to ensure the success of the entire University. She has been involved in almost every shared governance group at the UA and was recognized for her respect toward all members of the community and ensuring that all voices are heard.